The lively and engaging new “reimagined” production of the musical 1776 at Dramaworks votes that when it comes to revolution everything old is new again. When this Tony award winning production opened on Broadway in 1969, the USA was in enormous social and racial upheaval – much like today. The new version in Palm Beach makes a direct connection with the revolution taking place in the colonies and modern times. Dramaworks opens the show with the cast of 13 characters dressed in modern suits, sport clothes, and jeans, bustling about the stage reading newspapers, tablets, and phones. Flashing projections show headlines about current wars, elections and economic strife. The angry faces of the first female Democratic presidential nominee and a certain contentious Republican candidate whose Palm Beach manse can be seen from the plaza in front of Dramaworks loom over the stage. Then the lights dim and a whirlwind of activity resets the whole scenario before our eyes as women don corseted gowns, men switch to frock coats and a clever set of railings and benches on wheels re-create colonial Philadelphia, and its congress, parks, and houses. Then let the bickering begins. Thirteen colonies (Florida was not even a colony let alone a state) are fighting over whether to declare independence from distant controlling England and King George. The decision was not an easy one and came fraught with various north/south ideologies that were at odds. The north was becoming increasingly industrial while the south depended heavily on slaves for crop production. The stripped down cast of 13 actors, means that each plays two or even three roles. Most of the men switch between liberal and conservative, while the three women do male and female parts. Laura Hodos, a veteran of director Clive Cholerton’s musical concerts, is terrific as both the quietly passionate Abigail Adams and as John Hancock, who solidly presides over the Continental Congress. It’s an unusual dramatic device, and it works with varying degrees of believability with the women wearing tricorn hats, jodphurs and boots and in the case of Mallory Newbrough’s George Washington – a powdered wig under the hat. John Adams, played with simmering fury by Gary Cadwallader, takes the lead in Congress, bullying and expounding on the need for independence, while battling the lackluster attitude and follies of representatives who would often rather eat, drink, carouse and abstain. They express their frustration in the number “Sit Down, John.” The pressing heat of the summer in those pre-air conditioned times is another factor getting the actors all hot and bothered and eager to finish the business at hand. Adams persuades his colleagues that they need a written declaration of some sort so everyone is on the same page, so to speak, about what exactly they are declaring independence for and from. But who will write it? 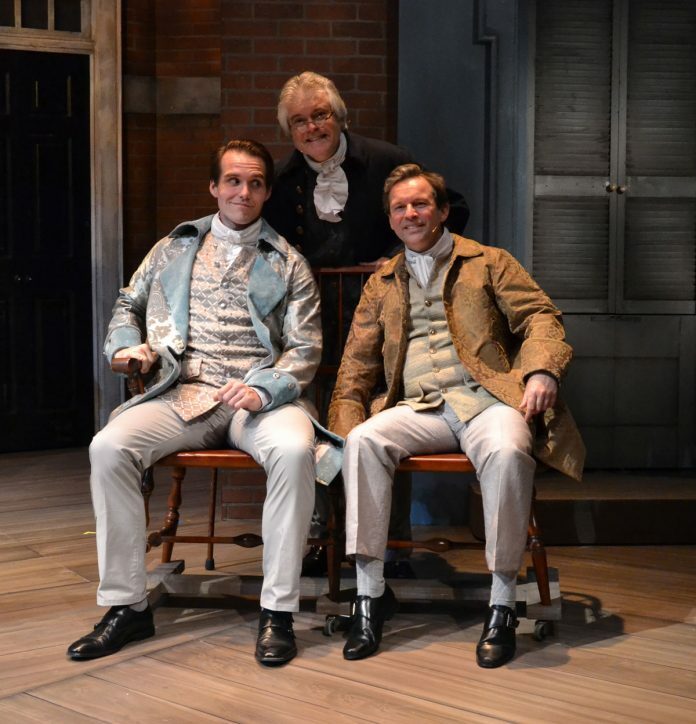 Surprisingly – or not – no one wants to take the responsibility of penning the actual quill feather and ink thing, as one after the other declines in “But, Mr. Adams.” Finally Thomas Jefferson, played with handsome verve by Clay Cartland, is left to take on the historic task. 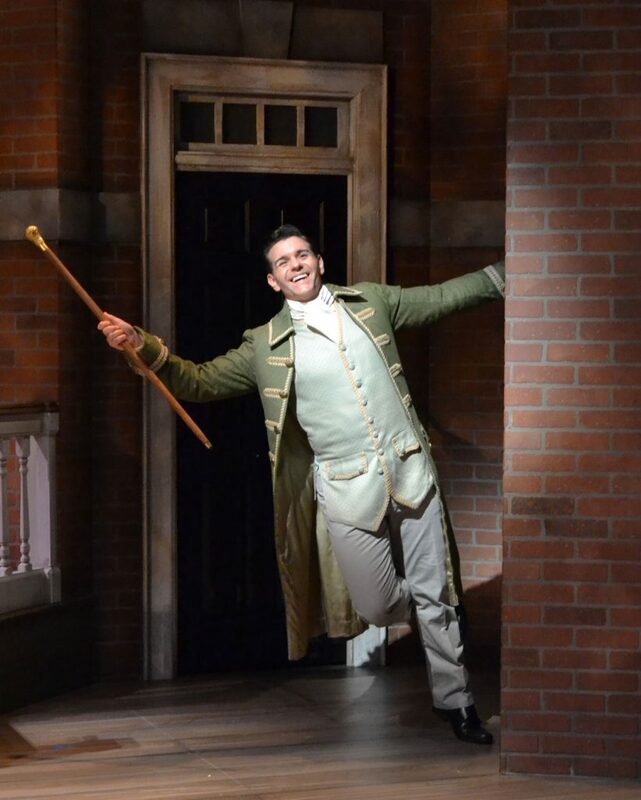 He only succeeds after Adams brings Jefferson’s fetching young wife Martha (also played by Newbourgh) for a much needed conjugal visit – providing some comic relief and reviving his political passion. Once it’s written it must be ratified, and a lengthy back and forth volley ensues with each representative asking for changes in language, meaning and content while the others sweat out the heat and pray for it all to end. We know how it will end, but the details and dramatic twists and turns of the actual events are unknown to most, a plot the show hones and shines like a new copper Abraham Lincoln penny. The songs sound fresh, enhanced by the excellent onstage five piece band. Exceptional musical work is by Dale Sandvold on the violin, and by 17- year-old bass/trombone player Mark Logonde of West Palm Beach. Standout numbers include Nicholas Richberg as high-spirited Richard Henry Lee prancing through “The Lees of Old Virginia” and the devastating “Momma Look Sharp,” powerfully sung by Newbourgh as a wartime courier who has seen death on the battlefield firsthand. The staging veered perilously close to camp a few times – particularly during “Cool, Cool, Considerate Men,” a mincing minuet for the coat tail tossing conservatives in the congress. But overall director Clive Cholerton does an excellent job keeping the actors constantly on the move, changing characters, costumes and sets in a choreographed weave that the talented and versatile cast makes look easy. Michael Amico’s floor to ceiling set uses colonial trappings of balconies, windows, carved wooden railings and benches to clever and versatile effect, often asking suspensions of belief in height and distance. The changing perspective is particularly welcome in the scenes in Congress, as the view cinematically changes from side to side and from the back to front of the room. In a pre-show interview, Cholerton said he aimed to keep the talky show from being too static and his approach works. Lighting designer John D. Hall bathes the stage in the soft, hazy look of a hot American summer. Brian O’Keefe’s elaborate costumes make detailed use of rich brocades, buttons and braid trim – while cleverly incorporating hidden magnet closures that allow the actors to make three second costume changes as they switch characters. Standouts in the large cast include Allan Baker as the humorous, ironic Benjamin Franklin (delivering some of his most famous quips) as well as a workman called Leather Apron, effectively switching from one of American history’s most popular and recognizable figures to an anonymous lowly worker. Richberg, whose primary role is as conservative Pennsylvania leader representative John Dickinson, keeps the audience’s attention with a flow of emotions, from knowing smirks to simmering anger, on his fine tuned face. The whole cast works overtime in double – and sometimes triple – roles, singing and playing out the heated drama in fine form. There is one clever scene that finds Adams, Jefferson and Franklin debating whether the national bird will be the peaceful dove, the soaring eagle or the tasty turkey. Thankfully the right choice was made, a move that soars as high as the spirits of this fully-staged production. An inspiring and unique piece of musical theater to enjoy at Palm Beach Dramaworks this July. To see it, please visit www.palmbeachdramaworks.org for ticket information, dates and hours.